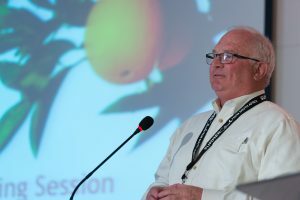 California Citrus Mutual (CCM) President Joel Nelsen issued the following statement regarding the Chinese government’s announcement that it will impose a 15 percent tariff increase on U.S. fruits and vegetables, including California citrus, as a retaliatory counter to President Donald Trump’s new tariffs on steel and aluminum. “The decision by the Chinese government to levy exorbitant tariff increases on U.S. produce will surely have a direct impact on California citrus producers. Maintaining access to foreign markets and having the ability to compete in a global marketplace are critical to the success of the citrus industry. The retaliatory tariffs imposed by China hinders our ability to be competitive by increasing costs for Chinese consumers, an important market for California citrus. Family farmers in our industry will suffer from the economic fallout unless we can find alternative markets for California’s navel and Valencia oranges and lemons. Nelsen and CCM Executive Vice President Casey Creamer and Board Chairman Curt Holmes are traveling to D.C. this week for meetings with Congress and the Administration regarding trade and other important issues affecting the California citrus industry.